If a Cub Scout has completed the second grade (or is 9 years old) and has earned the Bobcat Badge, he may start earning the Bear rank. He receives a Bear Scout handbook, Bear neckerchief, and Bear neckerchief slide when beginning the Bear portion of the boy scout trail. He will also need a blue Cub Scout Uniform. This part of the boy scout trail is intended to take one school year, preparing the scout to begin earning his Webelos rank after he completes third grade. Your Bear den will have opportunities to participate in Pack meetings. Prepare your scouts by having them ready to perform a couple of Skitsand lead the pack in some Games. By having a Bear favorite ready, your scouts will look good, have fun, and increase their confidence through leading the pack. Leader Tip: Choose 2 skits and games before September and do them at your first den meeting. Don't wait until your Cubmaster calls on you for a skit. 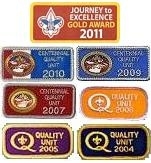 Leader Tip: Our pack awards the Bear badge at our May Pack meeting. If you begin your Bear program in September, this means you have 8 months to complete the Bear requirements. You must plan out what requirements your den will do and make a Schedule so everyone knows what is expected. A calendar kept up to date helps families keep track of their scouting commitments. Bear Scouts do adventures described in their Bear handbook that advance them towards their Bear rank. By completing adventures, the Bear rank is earned. Akela is the name given to the Cub Scout's parent or guardian, the caring adult guiding him along his Cub Scouting trail. Akela is responsible for acknowledging completion of each adventure requirement by signing and dating the appropriate spot in the Bear's handbook. There is also a spot for the Bear Den Leader to sign for each requirement. The Adventure Tracking pages in the back of the Bear handbook can be used by the Bear to track his progress all in one spot, and some dens use advancement charts or den doodles to publicly display advancement. After completing his rank requirements, a Bear can stay active throughout the program year by completing elective adventures with his Akela or his den, or at district and council hosted events. He may try to earn all adventure belt loops before moving on to a Webelos den.